Edward Wagner as he appeared during his initial pretrial hearing last month. After the first pretrial appearance of Edward “Jake” Wagner, one of four persons directly charged with the murders of six members of the Rhoden family in 2016, the Daily Times wrote that anyone looking for any courtroom drama in the case would have to wait a little longer. 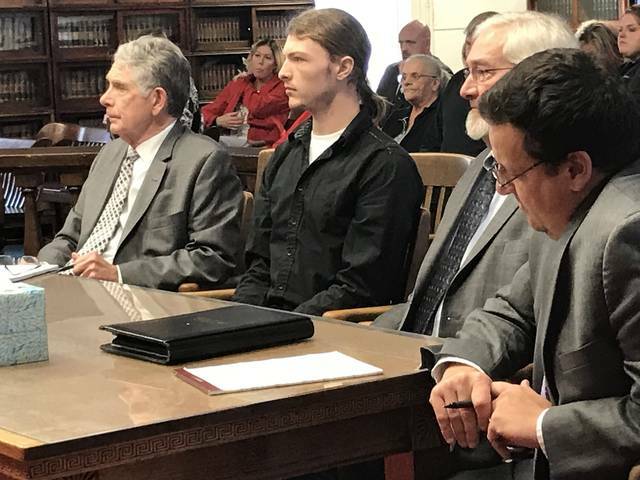 On Thursday, Wagner, the youngest of the four key suspects in the Rhoden case, was back before Pike County Court of Common Pleas Judge Randy Deering and at least a few fireworks came from Wagner’s defense team, court-appointed attorneys Gregory Myers and William Moody. Unusually, the proceedings began without Wagner’s presence in the courtroom. The defense team had previously requested Deering allow Wagner to appear in court in street clothes and unshackled. Prior to Thursday’s hearing, Myers said his client was unable to appear without restraints and therefore waived his right to be present at least for the beginning of the pretrial hearing. Deering said he had been informed by the Pike County Sheriff’s Office they were unable to provide a stun belt which would’ve taken the place of normal handcuffs. Deering added he expected the issue to be resolved before Wagner is scheduled to appear again in court in April. With that in mind, defense attorneys agreed to have their client appear in court Thursday. Presumably keeping any problems encountered by the sheriff’s office in mind, Deering requested media present to try and not take any pictures or video of the defendant wearing handcuffs. If restraints did appear in pictures or video, Deering asked those restraints be edited out. Perhaps a more substantial argument sprung up between Myers and prosecutors over the state’s request Wagner not be allowed any contact with any members of his family currently under indictment in connection with the Rhoden murders. The state has made the same request during all the other pretrials held to date with no objections from the various defense lawyers. In this instance, Myers argued since the other defendants are family, his client should be allowed some limited contact with them, so long as that contact not involve discussing the case. Added to the prosecution team by the state attorney general’s office, Special Prosecuting Attorney Angela Canepa said it was the beginning of “a slippery slope” to allow Wagner contact of any kind with indicted family members. She hinted allowing such discussions, but barring conversation of the Rhoden case would amount to asking defendants to police themselves. For his part, Myers made a closely related argument contending the ban on contacting Wagner family members under indictment could be construed to block him from speaking with other defendants he also represents. For his part, Deering said he never intended for any order to cause a “chilling effect” on Myers ability to do his job and represent his clients. Canepa stated at one point some of the issues raised were out of the scope of Thursday’s hearing and would have to be settled at a later date. Deering indicated defense attorneys that very day submitted five more pretrial motions. He gave prosecutors until March 15 to respond to those motions. According to the online docket, of the Pike Court of Common Pleas, Jake Wagner will not be back in court until April 4. Jake Wagner’s case may be seen as a key to the entire Rhoden murder mystery. Jake Wagner fathered a daughter, Sophia, who is now five, with one of the murder victims, allegedly a minor at the time the pair had sexual contact, an offense with which Jake Wagner stands accused. Prior to Deering placing a gag order on anyone connected with the case speaking to the media, Ohio Governor Mike DeWine, who was then state attorney general, stated during a press conference a custody battle over the young girl may be at the center of the motive for the murders. https://www.portsmouth-dailytimes.com/wp-content/uploads/sites/28/2019/01/web1_jake-1-smaller.jpgEdward Wagner as he appeared during his initial pretrial hearing last month.